What do you do with leftover fried food? I think some people re-fried the food again the next day for lunch and some people don't like leftover food at all.My family in Malaysia refused to eat leftover food at all,spoilt accordingly to me.Maybe they so used to have fresh food all the times and TV or frozen food is a "NO NO"! Luckily hubby don't really mind leftover food.All the times he eat the same food for 2-3 days . I guess for me living in US for so many moons already ,I don't mind eating leftover food.In fact I love it! I think the food taste better the next day. So usually I cooked our food more than we can eat.Remember I fried-fermented-chili-beans-fu-yee Pork Belly ? So the next day I modified the deep fried food to make another new dish..I sauteed with soy sauce and hoisin sauce..to make General Tso's Pork! 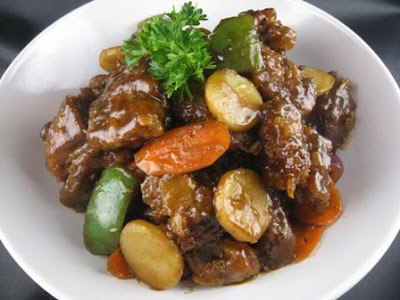 General Tso Pork/Chicken/Shrimp/Beef is widely know and found in all Chinese take out and buffet restaurants in the North America. 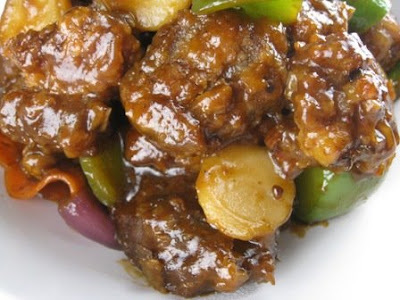 Check out my General Tso's Chicken 左公雞 HERE !! 1: Prepare wok with 1 tbsp oil at high heat with garlic.When garlic fragrant add in Chinese rice wine,hoisin sauce,soy sauce,sugar,dark soy sauce ,ground ginger powder ,chicken bullion powder and corn flour water dissolve. Reduce heat to medium and let the sauce simmer until it bubble boil . 2:Then add in all the cut vegetables and deep-fried-fermented-chili-beans-fu-yee pork in the thick sauce/gravy,stir well for 1 minute.If it's too thick or dry add in 2-3 tbsp water. Check the seasoning before remove from heat. 3: Serve warm with rice or noodle. hahaha!! dah lama tak dengar DBKL this version!! I ni also DBKL,have to sapu the leftover and my daughter food..no wonder badan size "wonderful"! hehehe! !